We somehow snuggled into blankets and slept on mattresses on the floor trying to sleep. Since it was morning teams that had camped in the night were ready to leave and there was too much chaos. People entering and leaving the room caused the door to open too many times and the cold crept in. After 1.5 hours of trying to catch sleep, I woke up and decided to get ready. I finally changed my clothing, socks and blister tapes. It was a new day and our spirits rose when we saw Raj, Radhika’s husband standing there to support us. He had gotten some fresh food and just seeing someone familiar helps. Morning sun just toughened our determination. We could do this! Just look at our happy faces :)!! CP 6 to 7 was a walk high on adrenaline. The trail opens into pasture and scrubland. Some parts of the trail open up to spectacular valley views. CP 7 – Time of Entry: 2.30 p.m.
At three-fourths of the way in, we found ourselves in a strange combination of fatigue, excitement and caution. 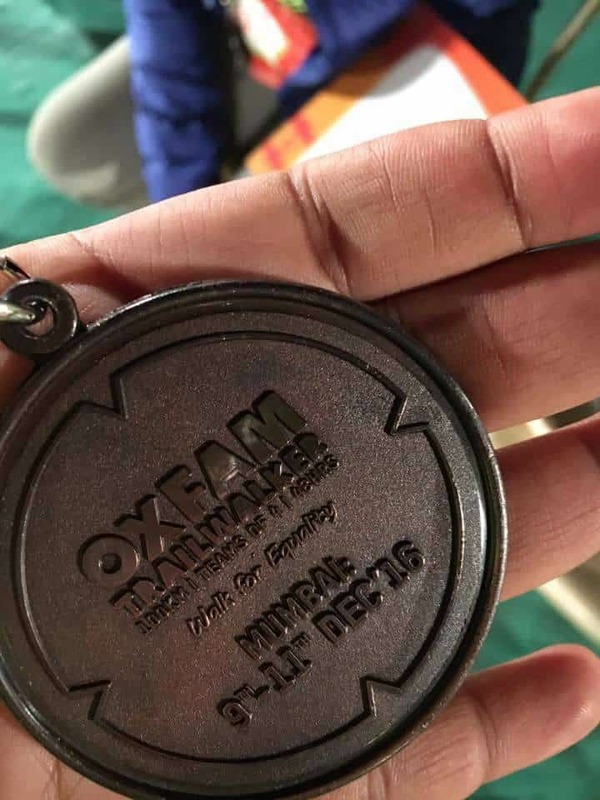 The finish line was within grasp, yet 25 more kms on aching legs, in anxious minds and on unknown terrain could not be taken for granted. Our team was beginning to become noticeably quieter. All of us seemed to be drawing some strength from our reserves now. We had a quiet discussion on how we wanted to proceed on this leg. We had finally realised that it was a great idea to have someone to pace the entire team. The pacer would set the speed, would look for the red ribbons and markers, would ‘feel’ the trail and basically think for the team. The flagging (rest of the) team then “just” had to follow. As a strategy, it was brilliant, because each of us could focus on what our (respective) bodies were telling us and walk accordingly. The trail itself started with gentle-yet-rocky upward and downward topography. Then into and around villages. On Bullock cart paths (muddy roads with a raised centre and ridges on either side). We walked through fields. In grasslands (or scrubland) and via pastures. 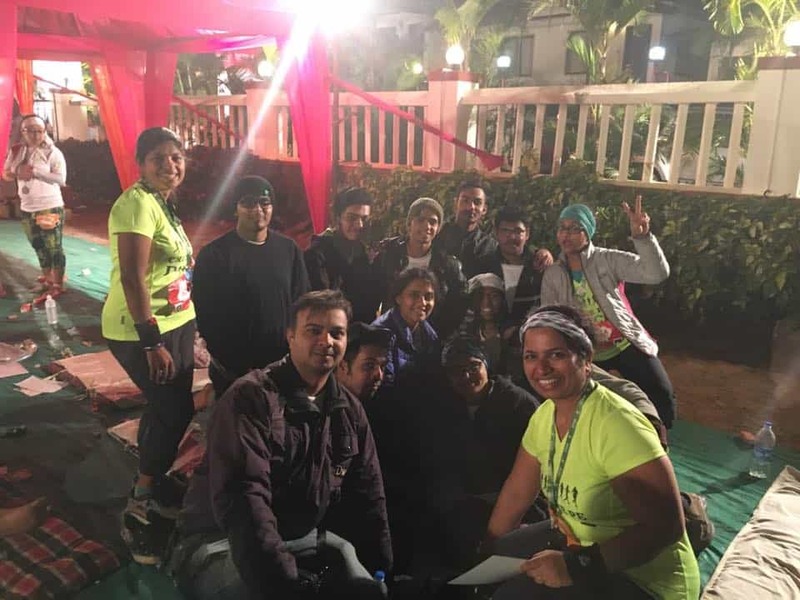 We crossed several teams that were walking 50 kms (in 24 hours) and were heartened by their cheers and words & looks of appreciation and admiration for us. But we never lost sight of the distance we still had to cross. The pace, on this relatively straightforward stretch, was excellent. Despite all the aches and groans and blisters we averaged almost 5 kms per hour (sadly, our first time on the TW, but better late than never, eh?). We stopped briefly to down an Enerzal each. Some pictures. And then off like the breeze, we floated again. The last couple of kms were up a slope, but we trudged on pretty gamely. We crossed barefoot walkers, village belles carting pots and babies together (smiling at us) and several school children assessing us curiously! 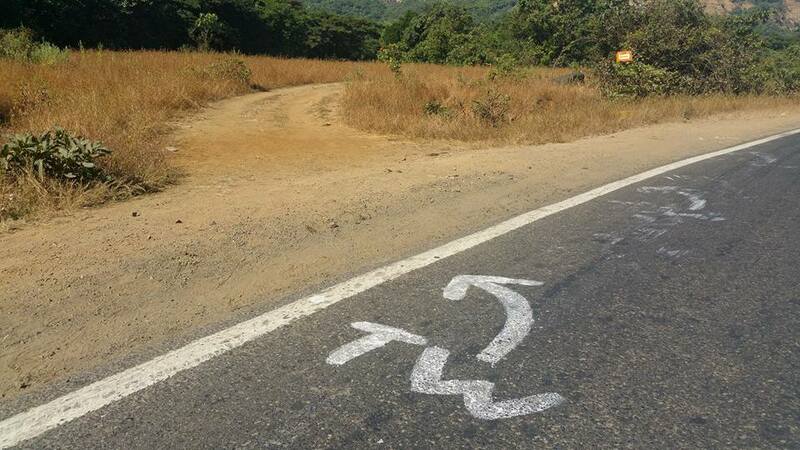 You have to be on a lookout for these arrows, as they might be placed randomly anywhere. If you miss these, you can go off the trail. And as our shadows started lengthening, we saw the welcome white tents of CP8. 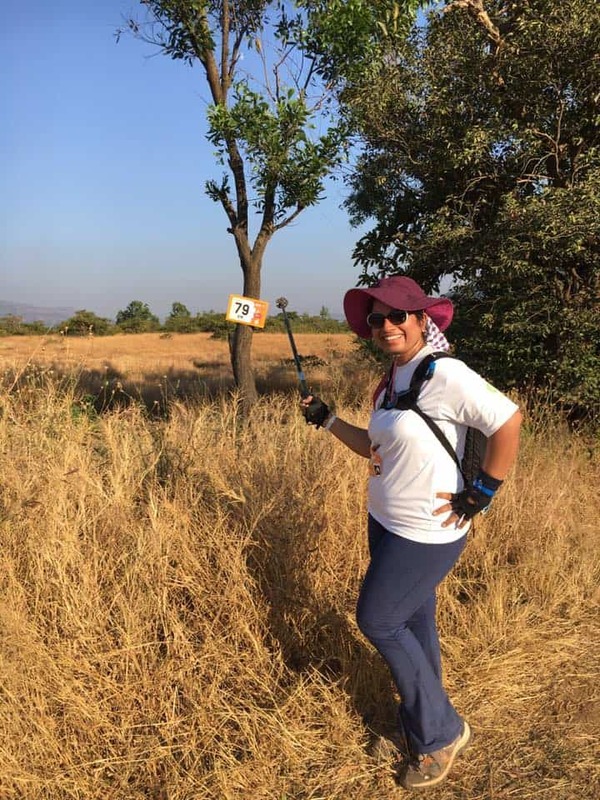 We had originally thought that this was a 10 kms walk, but to our delight, we saw that we had actually covered almost 12 kms, and were now only 13 kms short of our goalpost. This filled us with renewed energy and we literally danced into CP8. 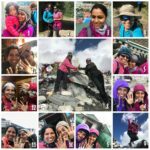 CP 8 – Time of Entry: 5.45 p.m.
Before we set off on this leg, we ate a hot steaming cup of Maggi noodles, and boy did it taste divine! Our amazing support member Anil Ji managed steaming hot cups of tea as well. We got several jealous looks at the Maggi 😉 We also got a bit of physiotherapy done – M’s thigh muscles, L’s heel & ankles (specific), R’s blister taping and in general some stretches. Our group huddle now was tinged with excitement. We were extremely hopeful of a strong finish (vs. a limping, straggly, almost-dead finish). “13 kms is less than a half marathon”, P chimed. We spoke about what we thought this stretch would entail (we knew there would be some upward stretches) and we agreed that we wouldn’t stop at CP 9 except to check in & out, for a loo stop if required and to refill our water bags. The stretch was quite gruelling (to put it mildly). The upward AND downward stretches were rocky, with lots of gravel and loose stones, branches at face height and plenty of steep step-ups. 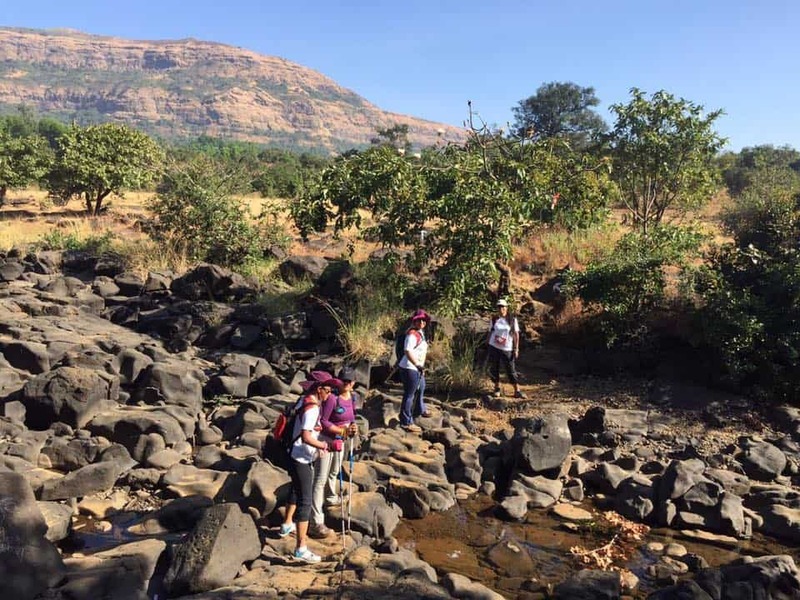 After 2 kms of a focused walk, the trail evened out into a bullock track and once we rounded a village, the path again was a bit of terrain. We plodded on, eyes on the prize. 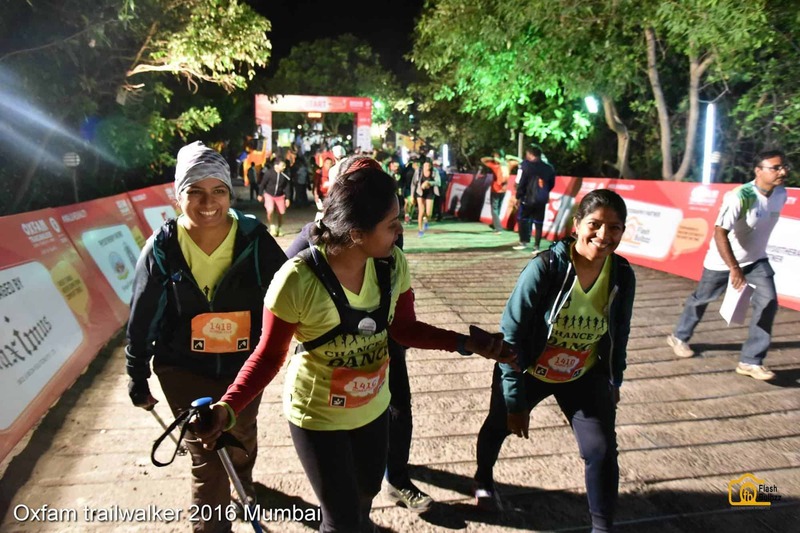 When we finally reached the almost-94 kms mark, we were tired, in pain and a wee bit angry at the organisers for having made this stretch so difficult. It was pretty dark now and with the cold winds and the low temperatures, exacerbated by lack of sleep and exhaustion, aching muscles acted up even more and all of us were sore and “hangry”. At the CP, tempers ran high. 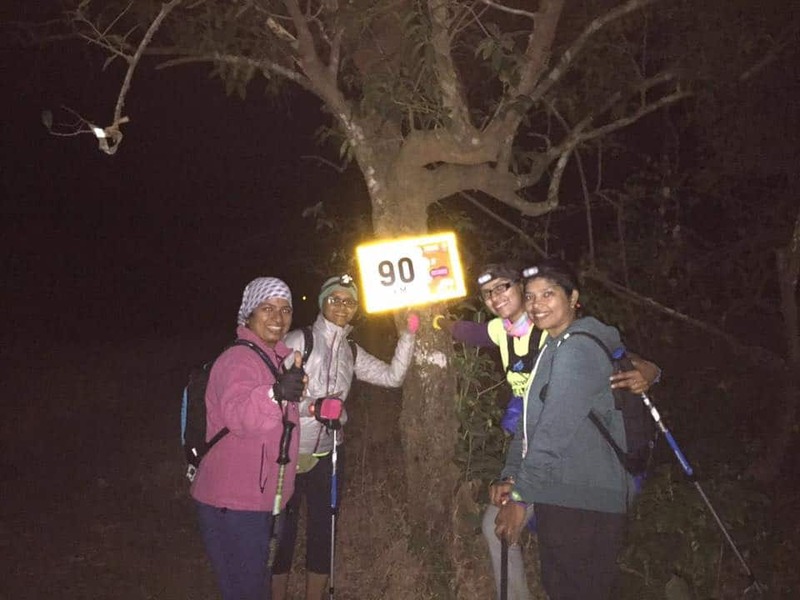 One team member wished to rest a bit, maybe grab a bite and stretch a few muscles, the rest wanted to continue and “just finish the [email protected] trail”! After some to-ing and fro-ing, the hungry teammate just opted to grab some parathas to eat on-the-way and we set off on the LAST leg of the trail. CP 9 – Time of Entry: Around 9.00 p.m.
Exit Time – 9.20 p.m. This stretch, we believed, would be a breezy gentle upward climb to lead us to our dream for many months now (albeit on and mostly, off!). We started off on a slightly uncomfortable note (because all of us were hungry, and we’d had a mild argument amongst ourselves). It was quite dark and the temperatures were not helpful at all. The path started off as a gravel-ly hilly track that evened out to a walk across fields and on rough village mud roads. After about 3 kms, we hit the road. 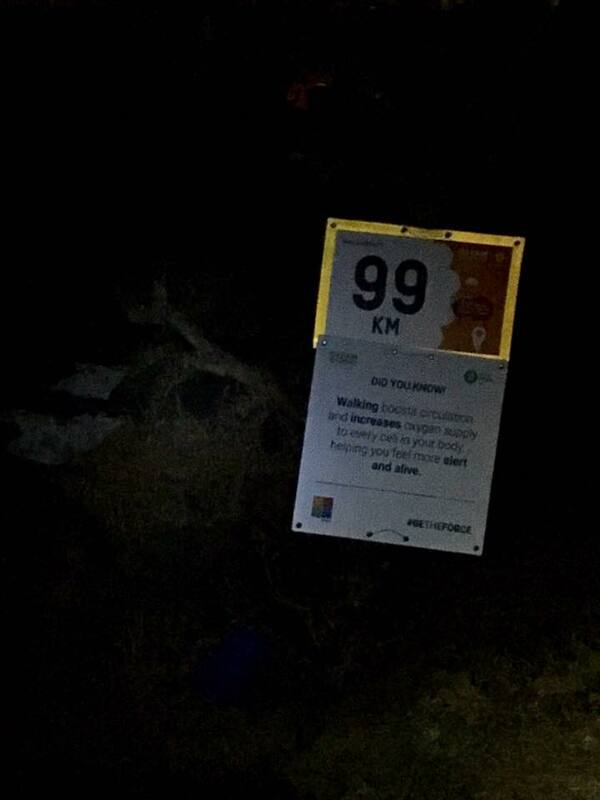 The elusive 99 mark, after which 100 km just seemed so long away. I am going to traverse on a tangential note now – much like the trail. During the walk, there was a period when I felt each of us hit a roadblock, a wall as it is termed. Basically, a point where you draw on your personal reserves of faith in yourself, your confidence and your inner framework of guidance… or you give up. The walls were different for each of us – for someone due to the sun, someone due to multiple blisters, someone else due to heel pain, another due to hunger, or lack of sleep. Personally, at about 95 kms, I believed that I hadn’t really hit any wall (despite a very badly aching upper left thigh muscle that I was able to push past) and a bad blister (that immodestly, I must say that I had completely pushed off my mind). Just when your ego sends these messages, the TW takes a turn, and there is one’s wall! The next 2 kms was a steep uphill climb on a tar road (the Amby Valley road for the detail-oriented) Somewhere along that stretch, I lost my cheer and it was only sheer determination to end the walk that kept me going. A combination of the physical effort required, exhaustion, a wave of sleep and a strange sadness that the TW was coming to an end came together to make me wonder why indeed I had to finish it! Whether the last 5 kms were so important! Whether 100 was indeed better than 95! And what were all these numbers after all?! Weird? You bet! Once you hear these thoughts echo around your exhausted mind, trust me, either you’d sit down and refuse to move, or buck up and push yourself to just get to that warm bed on the other end! No prizes for guessing which one I opted for. 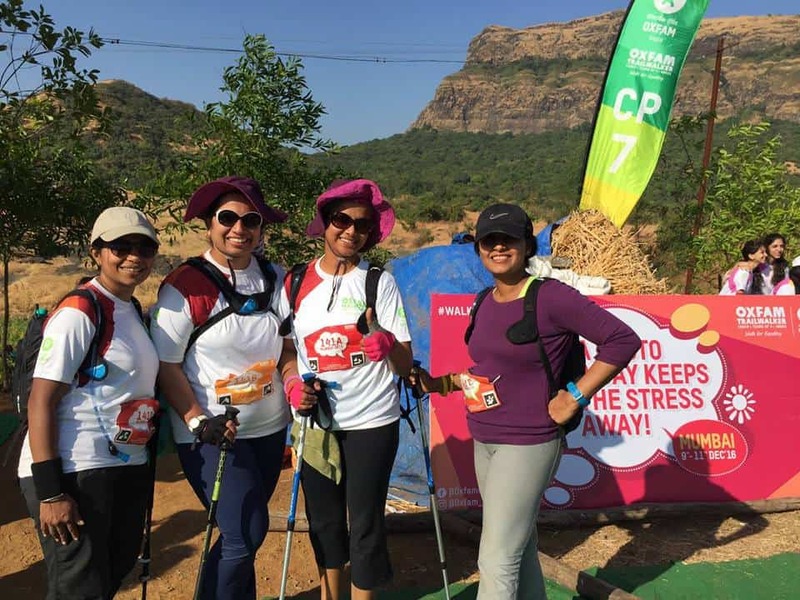 The organisers had schemed and plotted to make this a real trail down to the last 2 kms. The trail suddenly veered off the road. We could see the resort where the finish line was, even hear music, but did the road lead straight up to the resort? No! 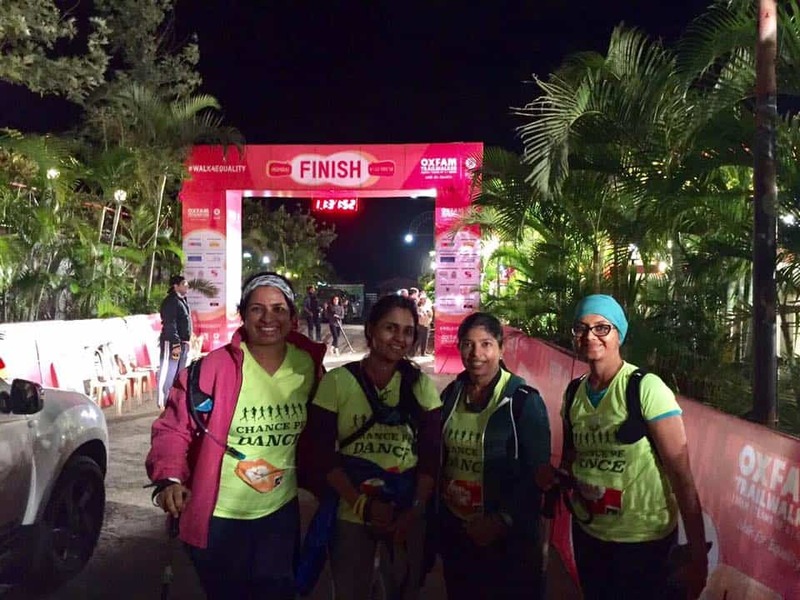 The path went over fields, around a pond, over a tiny bridge, across a construction site, behind the refuse area of the very resort, up a dirt track and back on the road up a really steep incline to the oh-so-sweet sight of the finish line. At 11.31 pm. Before midnight. Without any broken bones or torn muscles or murdered teammates. True to our name, we danced across the finish line and up to the podium. Got our medals, took plenty of exhausted-happy-smile photos, gave sound bytes, got our physiotherapy done one last time and headed back to our hotel rooms elated! The Oxfam physiotherapy team who were a great support! CP 10 entry time: 11.30 p.m. Preparation: I missed out on this one. Ideally, a steady build-up to the walk would stand you in good stead. Equipment: Good shoes, many pairs of socks, good trekking pole (s), sun hat, sunscreen and not-too-tight clothes. Important beyond words. Support Crew: A strong support crew is half the irritability removed. Planning: A basic plan and timeline chart is a useful tool to adjust one’s pace and rest-times to. Physiotherapy and Stretches: The physios at each CP are absolutely wonderful. Ceaselessly working through each person’s “pressing emergencies”, smelly feet and dirty toenails is more than service. It’s humbling. But I’d say, the next time I do it, I’d sit with them every alternate CP, and try and do some stretches myself on the other set of CPs. Being self-reliant is a big take-out of the entire walk. Food and Hydration: Important to eat, more important to drink water/ORS regularly. The camel pouch for sipping water regularly is a life-saver. It is a good idea to be self-sufficient in terms of food and have some dry food readily available over what the organisers provide. 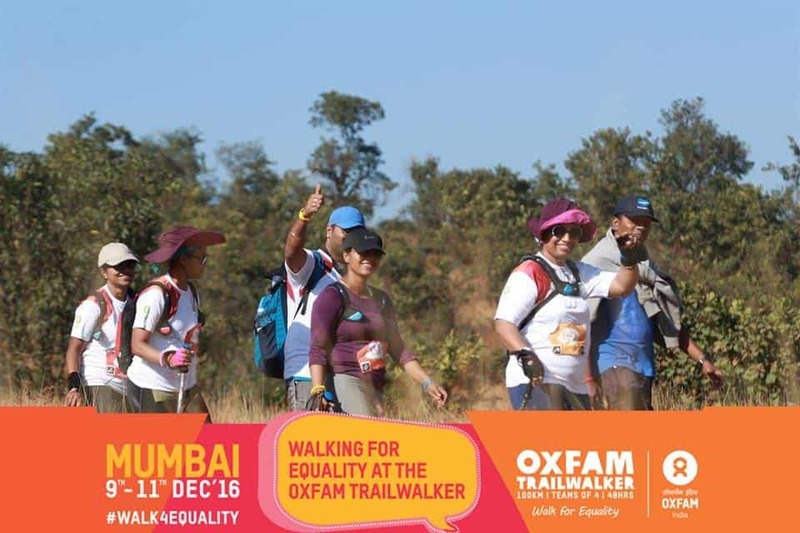 Self-belief: At the beginning of the trail, I chalked up the TW as a combination of 50 % willpower, 30 % stamina and 20% physical ability. At the end of the TW, I was humbled. It is the trail that allowed me to finish it, not my own prowess in any way. It is grace and the ability to enjoy even the difficulties. What it gave me is a quiet confidence. And the overwhelming understanding that it was possible because of so many things coming together beautifully, and that the ones who didn’t finish the TW’16 were just as strong and brave and blessed as we were.